The industry tour was part of the latest edition of Spark, a program from the WSU College of Agriculture, Human, and Natural Resource Sciences (CAHNRS). The program takes local high school students, this year from around Prosser, and shows them the wide variety of lucrative career options involved in agriculture. The goal is to spark their interest in pursuing a degree and career in ag. Four Feathers Wine Estates winemaker Becca DeKleine leads Spark students through, and above, the winery. 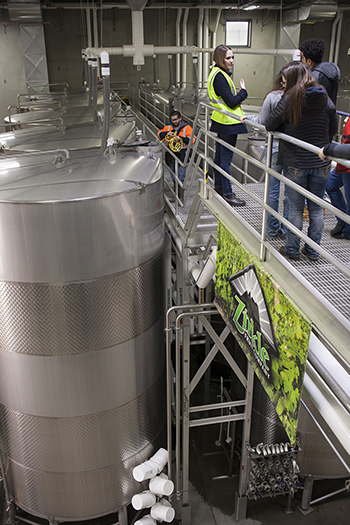 Some of their tanks hold up to 32,000 gallons of wine. This year, 25 students, ranging from freshmen to seniors, from Grandview, Mabton and Prosser high schools took part. The students invited to attend the Spark Program were from under-represented backgrounds who had previously stated they weren’t considering higher education beyond high school. The students spent the morning touring Zirkle Fruit Company and Four Feathers, then visited WSU’s Irrigated Agriculture Research and Extension Center (IAREC) in Prosser. At IAREC, they conducted “simulated” ag-related research with WSU faculty — discovering the science behind agriculture. Zirkle and Four Feathers provided tour guides with a wide range of backgrounds and careers. Both companies wanted to let the students know about the options and job opportunities, available to them as high school and college graduates. An employee at Zirkle Fruit Company shows Spark students the apple washing station in their packing plant. 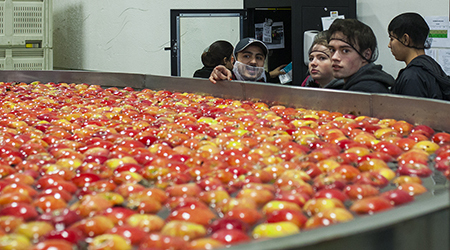 The students toured the Zirkle packing plant, where they saw apples go from large storage bins to a cleaning and sorting machine, to being packed into bags and boxes and shipped. Then, they walked over to the winery to learn about the process and science behind making wine. Zirkle provided a full breakfast and lunch for all the SPARK students. That success showed in surveys Sampson and her team asked the students to complete both before and after the program. The ‘after’ results showed that more students were interested in attending college, pursuing a career in agriculture, and were more aware of the various pathways that led to both, Sampson said. “That’s the point,” Sampson said. “Maybe a few of these students found a new interest that they can pursue in college, no matter where they go. We wanted to open new avenues of opportunity for them, and hopefully that leads some of them to WSU to pursue that interest. Helping along throughout the day were current CAHNRS student ambassadors, who talked with the high school students about their experiences and how they became interested in agriculture. In addition to WSU staff, Yakima Valley College sent a representative to talk about the value of starting at a two-year community college. Yakima Valley has agreements in place with WSU in several programs that allow students to easily transfer to WSU to earn a four-year degree. 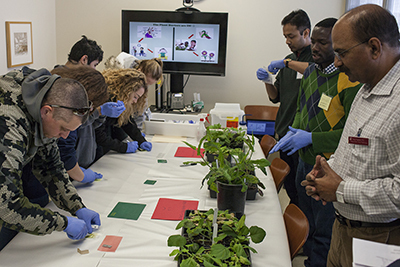 WSU professor and virologist Naidu Rayapati, right, and two of his graduate students show Spark participants how to conduct a test for a specific virus on tomato plants. In the afternoon, the program moved down the road to the IAREC, where WSU faculty members put the students to work on experiments. They tested plants for viruses, dug through soil samples, and learned about drones and robotics in ag. At the research center, the faculty kept track of which groups of students showed the most interest and had the best results in the experiments. All five students in the winning group received a $500 scholarship to WSU if and when they declare an interest in an ag-related CAHNRS major. Those scholarships were a donation from the McCoy Scholarship Fund. Lynne Willard, trustee of the fund, even participated to learn about the SPARK program.